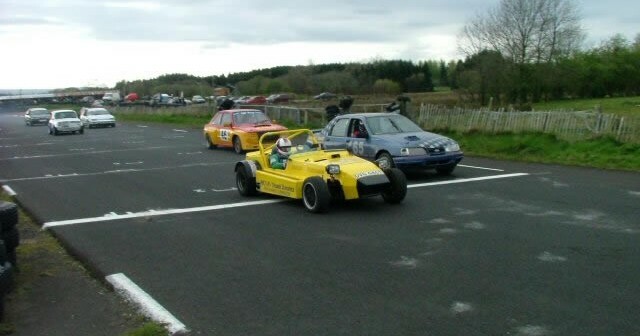 Well as it turns out the main event of the past weekend was the Track & Race Day at Aghadowey. With other events proving to be a washout, the Sun shone (albeit for brief moments) and helped towards making this event the best one yet by far. The usual main attractions were back in full force in the shape of Jason Gibson’s tyre-smokin’ Honda-Mini (if he ever gets a limited slip…my God! ), Buff’s Skyline and the ever-successful Alan McBride with the Black M3 engined 3 Series who is definitely the man to beat on the strip. The stars of the track-day kept the crowds entertained all day long. Everyone from the mad-man who landed the Granada in the gravel, the chap giving the blue M3 a death to the Drifters and the troop of Carltons and Senators, slithering their way down the straights. As some that tried and failed found out, yes there IS a knack to this! Well done lads for the display. The cone racing was a laugh to say the least. Only ever intended to be purely for the craic, it did not disappoint. 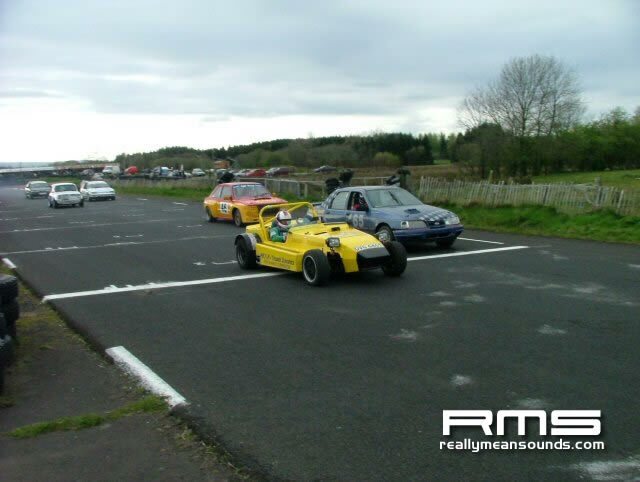 For some the highlights were the Clio that had to 3-point turn round the cone, the Nova that bit the dirt after running into the gravel and stalling or the Senators that were almost <em>too long</em> to diff on the main straight! For me though the Green Mini, McBride’s BM and Jimmy Hendersen’s Carlton were class of the field. Pity we were just gettin goin when the circuit owner put a stop to it all. He reckons it would take away from his Fire & Ice events, but I severely doubt that.